Posted on January 10, 2019 by Admin Posted in Events, New Build, News	. Building Committee and invited guests were from the left Doug Yeo, Stephen Jacob, Councillor Bill Whetstone, Bluewater Mayor Paul Klopp, Ben Lobb, MP, Warden Jim Ginn, Jentje Steenbeek, Lorraine Shields, and Henry Baker. 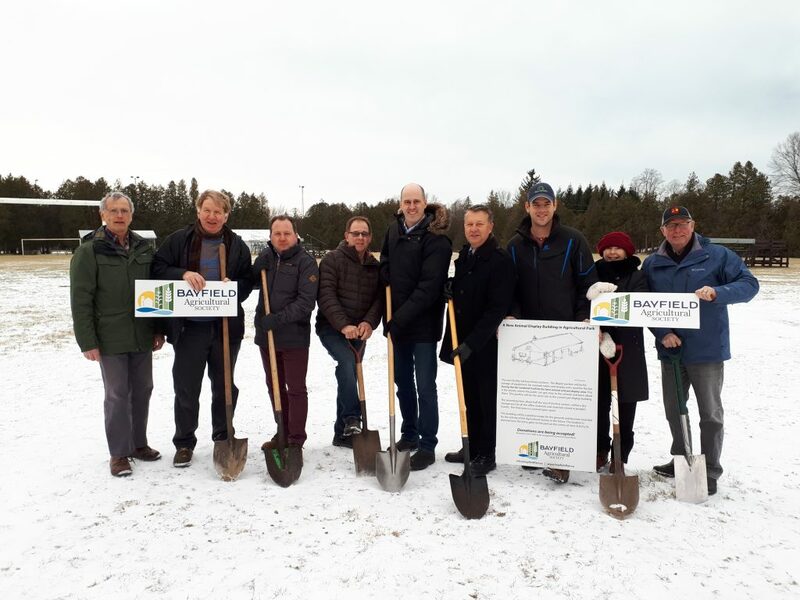 Though the day was bitterly cold, there was nothing but smiles from everyone as the Farm Animal Display Building Committee for the Bayfield Agricultural Society and guests posed with their shovels in hand ready to break ground for the project. The Bayfield Ag Society decided to replace its Animal Display Building over a year ago. When the weather becomes warmer a new building will be constructed near the front gates of the park. It will not only include a facility to let fairgoers interact with local farm animals but also include a section that will be storage but serve as an administrative centre during the fair. The County and municipality of Bluewater were thanked for their support in the project before everyone left for warmer places. The fundraising for the project is in its final stages thanks to the generosity of the extended community of Bayfield. Several agriculturally related organizations and many families were very generous with their support. Supporters will be recognized through engraved bricks which will be integrated in a donor wall. The project proves that the Bayfield Ag Society is looking to the future by ensuring vital infrastructure will make the park a safe and inviting place to visit. This new building will be a positive image for the grounds for generations to come. The opening of this new structure will take place during the fair which will be held from August 16-18. Posted on December 5, 2018 by Admin Posted in New Build, News	. 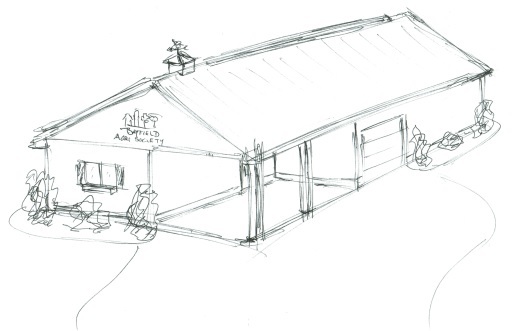 For the past several months the members of the Bayfield Agricultural Society have been given updates on the progress of the Farm Animal Display Building Project. It will replace the former Pet Display (old MacDonald’s farm) Building. This building is the Society’s agricultural awareness centre. Generations of fairgoers have had the opportunity to see and touch farm animals that were inside the building and been able to learn about them. The new building will be identical in size (30’x30’) with a dry storage (15’x20’) attached. This additional space will accommodate a secure office location for the three days of the fair and storage for the remainder of the year. The total cost is approximately $85 000. Over half of the cost is already raised through grants, solid commitments, and donations from agricultural organizations and individuals. The Bayfield Ag Society is needing the community’s help in raising the remaining $40 000. Support from members of the community is truly welcome. This building will be a positive image for the grounds and become essential for the activity of the Ag Society in the future. Donations can be made by cheques made out to the Bayfield Agricultural Society and mailed to our treasurer, Jim Erwin, Box 236, Bayfield in addition arrangements have been made to handle donations of stocks or bonds. All sponsor level donations will receive a charitable donation receipt for income tax purposes. If further information is required, call Doug at 519 482 9296. The cement pad was to have been laid In November but weather did not cooperate. The contractor has assured the building committee that the new building will be completed before the end of winter. We ask the community for support in sponsoring this project and celebrating this achievement. Posted on November 20, 2018 by Admin Posted in Uncategorized	. Posted on August 20, 2018 by Admin Posted in Uncategorized	. having the fair opened by the Ontario Minister of Education, Lisa Thompson, and comments provided by the Ontario Minister of Agriculture, Ernie Hardeman. Posted on August 12, 2018 by Admin Posted in Uncategorized	. In just a few days trucks pulling trailers of horses, cattle and sheep, transports laden with midway equipment, as well as cars loaded with flowers, vegetables, handcrafts, baked goods and children’s crafts will descend on Bayfield in Agricultural Park. This annual fair is a celebration of rural life and has been a part of the Bayfield scene for 162 years. Fairs are a community festival where friendly competition occurs whether it is with animals or a variety of indoor classes; it is a source of a variety of ever changing entertainment: and a chance to see some of the agricultural industry whether it is getting close to some of the animals, the machines, or products from the farm. This year the Bayfield Community Fair runs from August 17 – 19. Townsend’s Amusements will have a midway available throughout the weekend and offers special rates on Saturday after 5 p.m. and all day Sunday. The farm animal display will be open every day and is always a popular spot for all ages. A modern tractor will be available to imagine driving through the fields. The indoor displays which take up the bulk of the arena are filled with exhibits highlighting the talent, creativity, and gardeners in the community. The arena also has an area where the young people can play in the grain with some farm toys. A train will be making regular circuits around the grounds carrying kids of all ages. Friday night people can have their hunger satisfied with a ribs meal prepared by Pineridge and enjoy music on the RBC stage by Graham Bedard. Youth compete at the Rise2Fame talent competition for the chance to compete at the Western Fair. Several previous winners have done very well in London. The beer gardens are available for a relaxing night before it climaxes with fireworks. Saturday begins with a light horse show while many congregate along the main street of Bayfield for the parade at 11. The final float this year will feature an entertainer who will perform later in the day in the arena and also in the tent area. The fairgrounds have a host of activities taking place in every corner including two sheep herding demonstrations, bubbleology performances, a dunk tank, a Friesian horse show, the 4-H dairy and sheep competitions, pig demonstrations, a mini tractor pull, and a Discovery Tent. The day concludes with 21 Gun Salute which is an AC/DC tribute band renowned for their performance. On Sunday people gather under the tent for a community church service. The heavy horses and miniature horses compete in the two show rings throughout the day. The demonstrations of sheep herding and the Discovery Tent will again be held in the afternoon. A jamboree will be held in the air conditioned community centre while the watermelon competition will be visible near the tent. The Homecraft President, Jean Dunn, who coordinates all the indoor exhibits, states, “Meet old and new friends over coffee and pie.” Fairs are a community event for mingling with your neighbours and it is the opportunity to bring your many generations of family to a gathering that has something for all ages. Further information can be obtained from the website BayfieldFair.ca. Posted on July 25, 2018 by Admin Posted in Uncategorized	. Those who regularly exhibit at the Bayfield Fair are already checking the prize book to see what they can enter this year. With less than a month to go almost all the prize books have been picked up. The books left at Nip and Tuck disappear as soon as new stock is dropped off. New exhibitors are encouraged to find a book or go on line www.bayfieldfair.ca and look at the copy there. The library would help you find it if technology is just not your interest. Anyone with a garden is being welcomed with open arms to bring in vegetables, fruit, and flowers. With this drought there likely should have been a SMALLEST vegetable section not the biggest. The convenors that are listed in the book are all willing to assist any exhibitor if there is uncertainty in how to exhibit the produce. WARNING: Exhibiting tends to be addictive. You meet some great people whose real love is just growing things and sharing that with others. It is also a great time to get the photographs you need to fit into the categories listed. 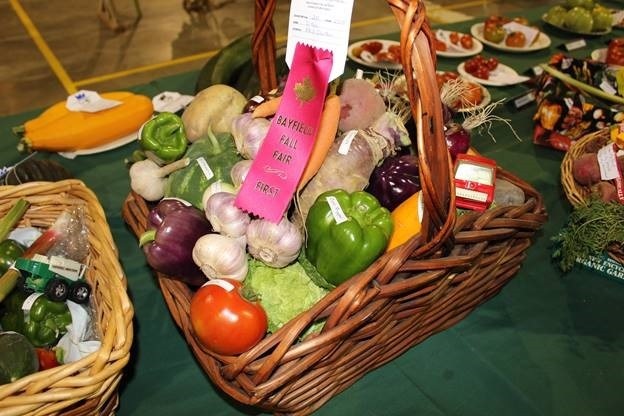 Picture taking is encouraged during the fair and any pictures which fit the categories identified in the OAAS Photo Contest need to be submitted before September 1 for judging. The winners there go to a provincial competition and Bayfield has sent entries and come back with winners for the last two years. There are many categories for youth. It becomes a great activity for them to work on when life seems a little boring. It’s an added bonus when they get to take home some money when they pick up their items on the Sunday of the fair. Winners of the poster and chocolate chip competitions have further competitions at the District and if they win there at the provincial competition. The winning posters are also used on the cover of the next year’s prize book with names attached. The fair also has competition in culinary arts, field crops, handcrafts, art, and woodworking. There are lots of opportunities for someone to show their particular talents and skills. If there is a class of something that is missing, bring it to the fair just to exhibit and that will encourage it being added the following year. The Bayfield Fair indoor exhibits are truly great thanks to the number of people who make a commitment to bringing at least one item to show. The cost to enter is $10 which includes a free pass for the whole weekend except for the jamboree and Saturday night music. Check to see what you have to exhibit and bring it on the Thursday night August 16 or Friday morning August 17 before the fair opens. For further information or if you would like to volunteer in some capacity email info@bayfieldfair.ca or contact Jean Dunn 519 565 5316. Posted on January 29, 2018 by Admin Posted in Membership	. It is awe inspiring to hear the listing of countless acts of generous activities of very humble people. Last Thursday Lisa Thompson, MPP for Huron-Bruce, hosted a levee honouring the Remarkable Citizens of 2017 in Teeswater. Forty people were honoured for their selfless contributions to their communities in this provincial riding. 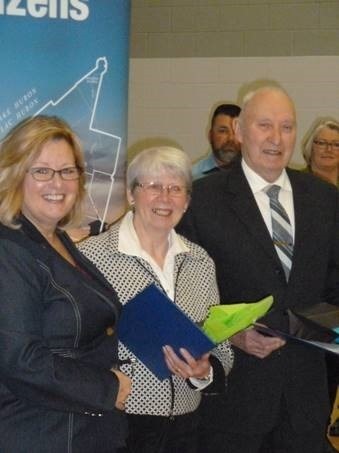 The Ag Society was pleased that Ted and Jean Dunn were honoured that evening –a couple who have served the Society collectively over 100 years. 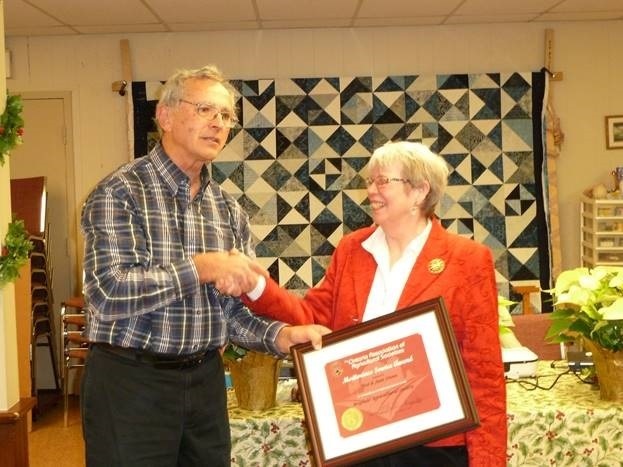 Ted began his connection with the Society when he was in 4-H. He served as President in four different decades and was part of numerous committees. His leadership was also seen in his church, his work and in the various music groups with which he has shared his tenor voice. His welding and design skills were used to make the gates that are hung at the entrance to Agricultural Park. Jean immersed herself into the Bayfield community following her marriage to Ted. She has been the Homecraft President for many years and encouraged many new exhibitors at the fair. Her church certainly was gifted with many of her skills. In addition to her family, her passion has been sharing her love of food. As a member of the Community Food Advisors (CFA) in Huron County she has introduced many with their first lessons on preparing food from basic ingredients and using local food. 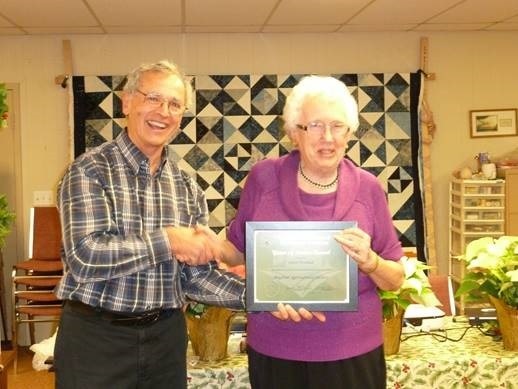 Ted and Jean are definitely remarkable citizens and the Bayfield community is the better for receiving the benefits of their time and skills. A date to mark on the calendar and celebrate is February 9th, Food Freedom Day. It marks when the average Canadian has earned enough income to pay for his/her entire year of groceries. This is really the celebration of the tremendous affordability of food in Canada. Perhaps it is the day we should consider making a donation to our food banks assisting those who do struggle to have enough income to afford good quality food. Happy Food Freedom Day. Posted on November 26, 2017 by Admin Posted in Meetings	. Bayfield Ag Society marked the end of the fiscal year Friday, November 24, 2017, as it held its Annual General Meeting. Following a potluck supper several awards were presented. Carol Penhale being presented with her 55 year of service certificate. A Certificate of Achievement is presented to someone or an organization which has contributed to the Society over an extended period of time and Libro Credit Union was the recipient. The Libro Credit Union has fully supported the funding of the 4-H programs at the fair and ensures a staff member attends to hand out ribbons for the sheep and dairy shows. The Certificate of Achievement being presented to Libro Credit Union. The final award was the Meritorious Award which is only given out rarely. It is for most worthy support of the Society over a long period of time and Ted and Jean Dunn received this award. The two have a combined total of over 100 years of service to the Society and have exhibited leadership over most of those years. The Ag Society is so blessed to have them as exemplary members. David Pullen was the speaker for the AGM and talked about the history of forestry in Huron County. He, through a series of pictures, talked about sections in the County which were being blown away because of the lack of tree cover. He reminded everyone that crops grown beside a line of trees do exceptionally well a couple of rows from the trees because of the shelter and benefit the trees provide. The tree planting currently is only matching the level of trees being cut down within the County. He mentioned that the next species of tree which might be in danger is the beech. It is such a loss to have lost the butternut, the elm, and the ash. At the Annual Meeting greetings were provided by John McPhee on behalf of Lisa Thompson, and Bart Scherpenzeel and Bev Jantzi for District 8 of the Ontario Association of Agricultural Societies. The new potential building project was described by Stephen Jacob. The past year witnessed a fair with a larger than normal attendance and a greater number of exhibits and exhibitors. A second Breakfast on the Farm was enjoyed by everyone and was a great educational event. The organization adopted its first formal logo to identify itself. The incoming executive will be: President –Jentje Steenbeek, 1st Vice President –Stephen Jacob, 2nd Vice President –Lorraine Shields, and Past President –Doug Yeo. Susan Lehnen will continue as Secretary and Jim Erwin as Treasurer. There were several people who attended the event for the first time as well as many who annually come. There is always room for new people who would like to share their skills with an organization which organizes the annual fair –a community festival of sorts. It also connects with other organizations in the village and has developed a Breakfast on the Farm event. Its mandate is to give greater insight about agriculture. We all are connected with agriculture whether we are a producer, an agri-food industry worker, or consumer. All of us are part of the story and an Agricultural Society welcomes everyone no matter how they are connected. We can be contacted at info@bayfieldfair.ca. Christmas Update: there are a few wreaths left as well as three Christmas planters. Contact Don at 519 263 2404 or John at 519 565 2479. Posted on November 19, 2017 by Admin Posted in Events, News	. The lights on Clan Gregor Square have been turned on, the parade wound around the village, and Santa has made his first appearance. These are sure signs that we all need to be getting ready for Christmas. The Bayfield Agricultural Society will make your decorating easier if you need a wreath or tail. There are a few left after the sale this past weekend and can be seen at John’s by calling 519 565 2479 or order one through Don at 519 263 2404. They are all made from local greens and the money goes to support the upcoming fair in August. 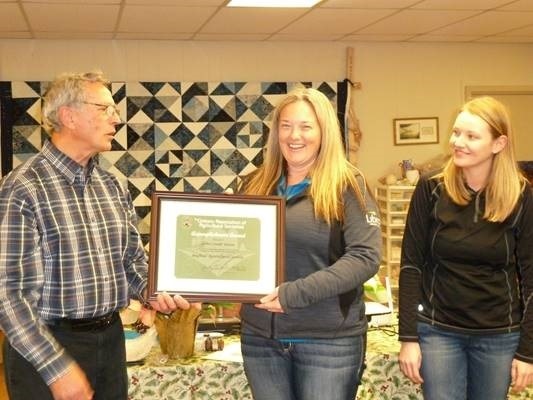 A highlight for the Bayfield Agricultural Society is the Annual General Meeting. This will be held in the basement of St. Andrew’s United Church on Friday November 24. Food is always a major focus of the organization so the evening begins with a potluck dinner with people arriving at 5:30 with the meal beginning at 6:00 p.m. There is always lots of food with the main course for many of those attending being the desserts. Special awards will be presented at 7:15 to 9 members with years of service followed by two very distinctive Ontario Association of Agricultural Societies’ awards –one achievement and one meritorious. David Pullen, County forest conservation officer, will speak at 7:30 p.m. tying together forestry, fishing, and farming which is the theme of the fair for 2018. David is well known for his presentations and he is looking forward to speaking in Bayfield and sharing his views on his passion –the preservation of forestry land. The Annual Meeting begins at 8 to summarize what the current year achieved and put the people in place for organizing the goals for 2018. Everyone is welcome to any portion of the evening and learn a little of the organization and what its mandate is. The Society is planning to take on a major building project in the coming months. The pet display building is now past its prime and needs some major renovations and the decision was to replace it entirely. There is also a need to store paper, ribbon, and boxed supplies in one location. A plan is to build a 30 x 50 foot structure solely for storage and then for use as a pet display building during the fair. Building costs have increased considerably over the past few months due to forest fires in B.C. and hurricanes in Florida. This has put the cost to nearly $100 000. Supporters of the Ag Society and its work are asked to contact us at info@bayfieldfair.ca. We have started the conversations about how you can help us achieve our goals. This is one time when we really do need our supporters. It has been a long time since a building was contemplated.